Finnish driver Jari-Matti Latvala wins Neste Oil Rally Finland, 8th round of World Rally Championship. This is the third time the Volkswagen Motorsport’s driver celebrated in his home rally, after his previous successes in 2010 and 2014. The only serious rival to Latvala and his VW Polo R WRC was his team-mate and reigning world champion Sebastien Ogier, but he confessed that the ‘flying Finn’ was too strong this time. The difference between them was only 13.7 seconds after 20 special stages and 320 competitive kilometres. 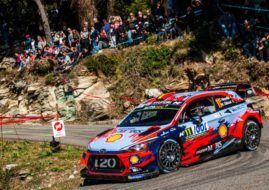 Rally Finland is one of the most popular rallies in the world but if you are looking for the fastest rally, there is no doubt that it is at the top of that category. There were a few special stages with an average of speed above 130 km/h and Latvala became the winner with highest average speed in the history – 125.4 km/h at the end of the rally. In fact, some of them even badly damaged their cars and had to retire, while other rejoined the competition but lost good positions. Mikkelsen crashed with Polo on SS5, while he was sixth. Hayden Paddon destroyed his Hyundai i20 WRC in the next stage and lost 5th position. Dani Sordo was stuck in a ditch in SS15 and lost some parts of the car, and more importantly, time and his 6th place. Kris Meeke was on third position when he lost control of his DS3 WRC and went off road on SS16. He damaged the car’s suspension and retired. Meeke restarted on Sunday to get at least one additional point with third place on Power Stage. Robert Kubica had an alternator problem on Friday and retired on SS6, when he was sixth. He rejoined the competition on Saturday, but one more retired after a heavy crash at the end of the last special stage that day. Citroen’s Mads Ostberg once again proved to be consistent and maintained a good pace. He avoided problems and was third at the end of the rally. Ostberg finished all eight races and with his third podium this season remains third in the championship standings as well after Ogier and Latvala. Apart from Volkswagen and Citroen, other two manufacturers have their drivers in the top 5. One of them is Thierry Neuville, who had a serious incident in shakedown before the rally and had to get his car repaired. He finished fourth, four minutes behind the winner and half a minute ahead of M-Sport’s Ott Tanak. Tanak also had problems with a broken damper at the legendary stage Ouninpohja on Friday. Because of nine stages without service he lost lots of time and finished 10th that day. But with a repaired car on Saturday’s stages he was fast again and managed to end at the 5th spot in the end. Other top points scorers include privateers with Ford Fiestas: Juho Hanninen and Martin Prokop, Škoda Motorsport drivers Esapekka Lappi and Pontus Tidemand. The Top 10 is rounded with Lorenzo Bertelli who scored his first point in the world championship. Lappi and Tidemand, both driving the Škoda Fabia R5, were the fastest in the WRC2 category. Third was Stephane Lefebvre with Citroen DS3 RRC. The winner of WRC3 and Junior WRC class is Quentin Gilbert, with an unbelievable margin of just 0.5s ahead of Finn Henri Haapamaki. Third was Ole Christian Veiby, three minutes behind the leading duo. Drive DMack Cup winner is Tom Cave, ahead Marius Aasen and Max Vatanen. After 8 events, the leader of the WRC points standings is Sebastien Ogier with 182 points. He is followed by Latvala (93), Ostberg (84), Mikkelsen (83) and Neuville (70). The best team is still Volkswagen Motorsport, ahead of Citroen Total Abu Dhabi WRT and Hyundai Motorsport. Next race of World Rally Championship is ADAC Rallye Deutschland (20-23 August).